The Dutch East India Company and other companies of the wide world have used emblems on official documents or to mark property, but which logs were used and when? I'm finding conflicting information regrading the economical powerhouses and what logos, insignias and emblems were used and during which years they were employed. I'm also curious about the emblem used throughout PoTC 2 and its authenticity. Any company emblem information would be appreciated, as we may be using them at PIP to mark 'acquired' goods and sundries. 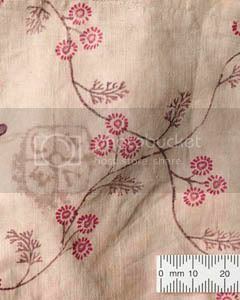 This would also include woodcuts, engravings and all matter of art found on letters of marque and other offical papers. I have also seen it with and without the 'A'. The "A" denotes the Amsterdam section of the VOC. The flag is from 1685. It's changed over the years. There is a website with various time period flags on it, google BEIC flags. The various versions of the official seal are easily findable for decent, large images with sufficient detail for copying. The merchant's mark, or 'bale mark', is, believe it or not, featured on the modern website of the BEIC. It's still in use. 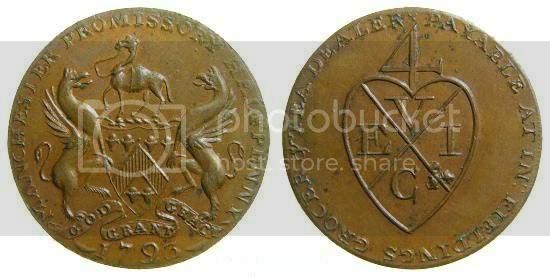 The oldest reference image I found was 1793, when it turned up on proprietary coins, but on the other hand, why would it have been changed? Is the VOC the Dutch EIC? What about the Danish EIC? When was that? Most interesting is the part about Danish privateers. Huh. St. Thomas was originally part of the Danish West India Company. Thank you for the legwork thus far. I'm hoping for many more references. This is the emblem of La Compagnie de Indes. Merchant's marks, I don't know, but knowing antiques collectors, if you want examples of merchant or company marks your best bet is china dealers and stamp collectors. They know everything. You could e-mail English stamp collectors for some information, they might help. Possibly your library may have a book or guide on identifying imported china, Kovel's or another publisher, and these books often have guides to marks, usually found on imported china. I'm going to guess the marks stayed pretty consistent through the life of the companies. As far as individual merchants, the one mark of the period I was able to find (couldn't nab it for pdf reasons) was of a Huegenot refugee merchant in England, but it was French, and stays pretty close to the 'sign of four' design common in the Brit merchandise, and you might be reasonably safe designing a cross-shaped mark for period flavor, if not complete authenticity, if there is a total absence of visual references. Just a thought, don't take it too seriously. The Danish West India Company had a separate flag with a dark blue field, but doesn't seem to have come into any real use until the late 18th century. The merchant ships of Danmark seem to have used the Danish flag. Since it's the oldest flag design still in use in the world, they seem pretty proud of it, and use the cross almost exclusively. The split-pennant flag may have been used on ships in the time period. For seals or merchant's marks I drew a total blank, and that's everything I have in the house. Good luck! 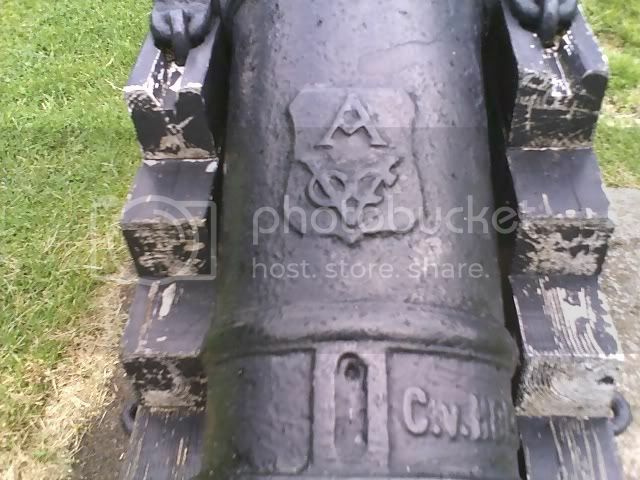 VOC cannons with Logo. I was up at Bear Mt. NY and in front of the lodge there were two cannon. Both have the A VOC emblem on them. I wonder what time period this might be from. remembered this thread, so I thought I would post about them here. Ok, seems I still don't have a handle on this photo thing, I will try the link method. Also an interesting point made on the sight, Henry Hudson's 'Halve Maen' ("Half moon") was a VOC ship. His Hudson River exploration is coming up on it's 400th Anniversary in 2009 and he sailed from Amsterdam! 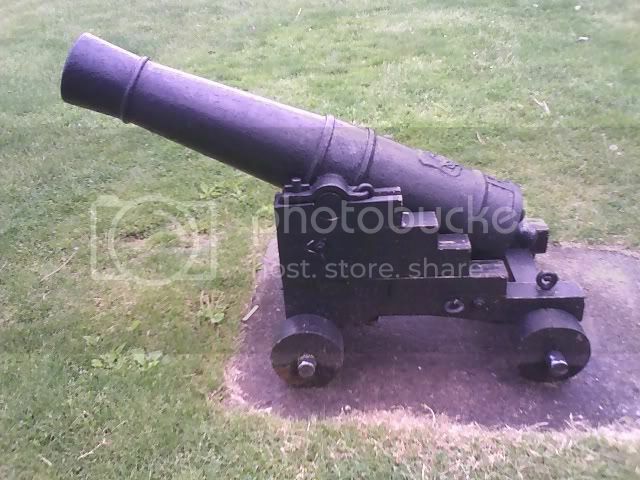 so I would guess that things he carried were marked with the 'A' VOC Hey, Henery, you missing some cannon? Do we know what company or merchant the symbol on that bale represents? Is it a symbol at all or an artists mark? If it is a mark of ownership, what other ones are known and documented? Was the East India Company icon featured in Pirates of the Caribbean historical? If not, how did they mark their goods? I'm trying to put together a collection of these images. Here's a sample of what I'm looking for. 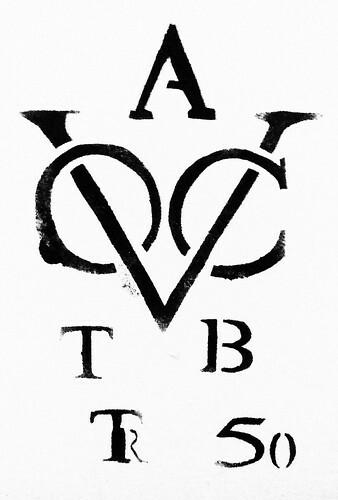 Below is an image of the logo of the Duct East India company (Vereenigde Oostindische Compagnie ) 1602-1800. Note, the A at the top specifies Amsterdam and wasn't always present in the logo. A Victorian era EIC mark: still looking for something earlier. You might want to Google or library search "merchant's marks", as it appears that many merchants had private marks at that time. Apparently companies assigned these "Sign of Fours" so as to protect from pyracy, the Devil, and other unfortunate events. Courtesy of Wikipedia. Hmm, that is interesting. Note there's a four on both of the english examples above. Very cool. I wonder where that tradition came from? I'll have to look further in to it. I heard that the 4 comes from the term "Sign of Four," which in turn came from a Christian symbol of the Greek letters Chi and Ro...not sure what those mean though. It should not be lost. Eye just got me some custom made clay pipes withthe VOC emblem on them today.. This has been a hard subject to research for me. I've found several emblems, what I've been trying to research is what was the size for the majority of labeling on cooperage and crates? We've been guessing thus far.. 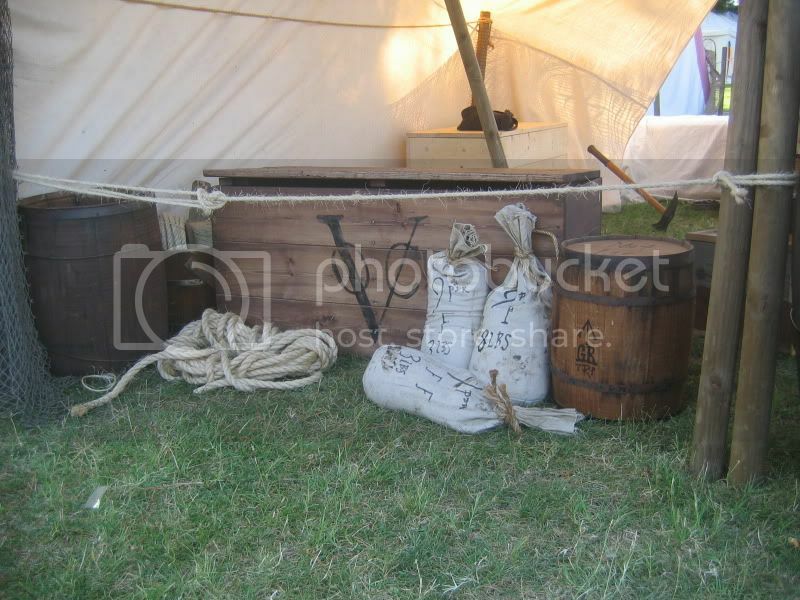 The VOC box in the pic is one of our ice chests/food storage and as you can see we labeled the box quite large....hmmm. So while were on the subject, anyone have any research on sizing as well? I hate assuming, but one would think that they would want to be labeled so sailors could see whats what when unloading goods..
For some projects I am going to do for this coming season, I'm going to need the logos for shipping companies from the 17-teens. These can be ANY nation. Some of my projects will include "re-used" canvas formerly used on shipping cargo and hatch covers. As such, logos (or parts of them) would add a little visual interest to them . . .
Edit: Also, this could be useful to others to use and reference at events too.